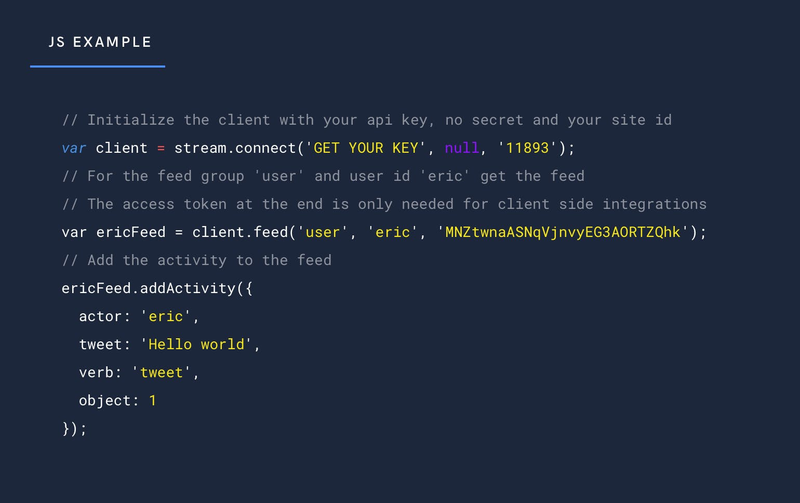 Stream helps you build social networks with Python. Build, scale and personalize your news feeds and activity streams. Python Aggregated Feeds, Ranked Feeds, feed specific analytics and personalization all help you improve your app's engagement, retention and conversion. Python is a powerful, mature language that is easy to learn and has a very strong following across web, systems and scientific developer communities. When it comes to building large, performant and reliable web applications, Python is a solid choice. It’s trusted by developers at the largest of tech companies like Google, Facebook, Instagram, Twitter, and Uber. We use it heavily at Stream. As a language, Python is somewhat unique in that it uses whitespace and indentation rather than semi-colons and brackets to delineate code-blocks. These syntax rules and other popular style conventions lead to more concise code. It’s also argued that this characteristic makes it easier to read and therefore learn the language. For the web, the vast majority of developers have migrated to two popular frameworks, Django and Flask. Plenty of teams also build “from scratch”. For deployment and hosting there are a myriad of options with Python. Heroku and Google App Engine are popular platform hosts while there are always the go-to options of Amazon Web Services, Azure, Digital Ocean, and Google Cloud Platform. Our Client API for Python is stream-python. Continuous integration is via Travis and we publish to the Python Package Index. Contributions in the form of issues, feature suggestions and pull requests are most welcome. mail_outlineContact us if you're using Python and want to be featured.